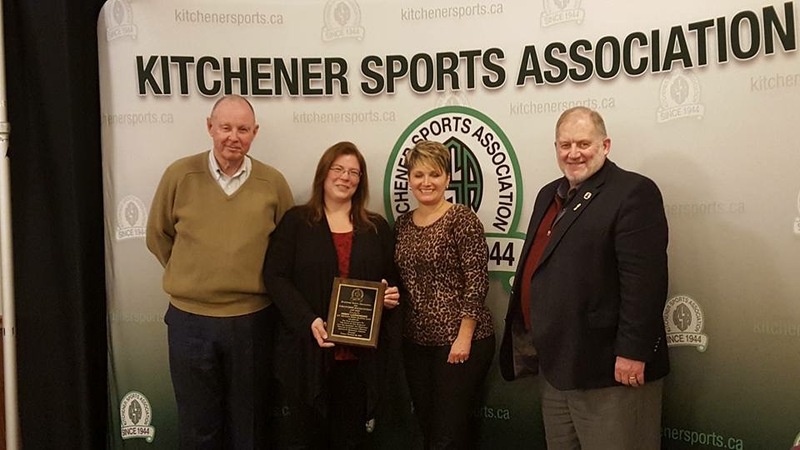 Deb Langridge is the winner of this year’s Kitchener Sports Association Volunteer of the Year Award for the KW Sertoma Speed Skating Club. She was honored with this award on November 22nd in Kitchener. Congratulations Deb on a job well done! Here’s Deb’s bio for the award. Deb is in her 10th year with the KW Sertoma Speed Skating Club, volunteering in various capacities as both a parent and a board member. Deb joined the Executive Board in 2012 and is currently in the role of Club Secretary, managing monthly meeting minutes and any reporting required by our club. In addition, Deb manages our public and members email accounts, is back up to our registrar and a member of our policy and ice structure committees. Deb also volunteers for the Ontario Speed Skating Association as a Level I recording official and is currently working on her Level II certification. To all of these roles Deb brings diligence, compassion and the desire to always put the skaters’ best interests first. Her most important role of all is as a proud mom to her 2 speed skater boys who compete in both short and long track racing, while her husband coaches some of our top skaters. Deb and her husband Jeff also skate with our club, and show the true spirit of volunteering through their actions both on and off the ice.